The Ultimate Bale Feeder from Truline Post Drivers feeds out six square bales or five round bales in both hay or silage. It can feed up to 700 cows in 20 minutes. It allows strings to be cut of bales, without the need to climb onto the machine. The Ultimate Bale Feeder feeds out all bales without having to get out off the tractor. It breaks biscuits up and feeds out in windrows, making hay go further. 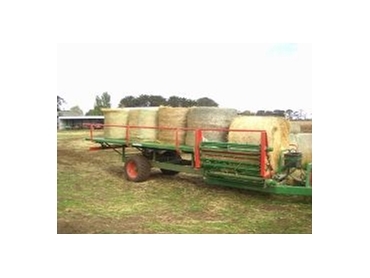 The Ultimate Bale Feeder can carry in eight round bales during harvest, making it a large trailer as well. It comes with a hydraulic parking jack and is available in options to suit individual needs.